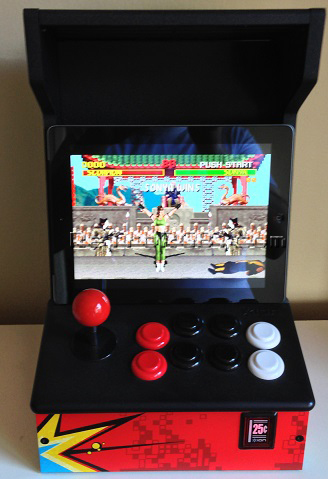 First, you can get an iCade very cheap if you look in the right place (check the links to the right –>). Second, tablets…even iPad’s (used ones, at least) have come way down in price. The thought of spending less than $200 for an iPad 1 or 2 and an iCade actually sounds like a great idea. It’s a lot cheaper and easier than buying a full Mame machine. Second, I love this thing for the exact reason I first mocked it: It’s a friggin mini arcade machine! I’ve enjoyed playing many of the classic arcade games via iMame and my iCade! As result of the way the iCade mappings work (which I explain in detail in the main iCade section), there is an occasional button lag or glitch. I’ll say this though: I played through many Arcade, NES and other games with my iCade, and the lag never ruined the experience. If I had spent $1000 on a full-sized mame-machine, I might be upset, but for a cheap device, it’s excusable. One thing I’ll note is the buttons and stick feel like actual arcade controls, not cheap plastic reproductions! Pretty cool for a cheap device like this! ION iCade jr. BNiB Miniature iPhone Arcade Cabinet Arcade Gaming For iPhone!